After just a few minutes online, seniors and caregivers receive recommendations on types of care and services, both inside and outside the home, which fit their needs. When a senior can no longer live independently, it’s often challenging to determine the level of care they need as well as find that care. To facilitate this difficult process, the Seniors Guide has recently developed an easy-to-use, online assessment form to guide seniors and their families in choosing the personal care or housing that’s right for them. The assessment tool, which was developed using Seniors Guide’s extensive knowledge of the industry, inquires about everything from a senior’s ability to dress him or herself to mental awareness. With the user’s responses, the tool immediately delivers “suggestions” regarding care and housing—everything from home care to nursing care. The tool even recommends products and services, such as realtors and movers. All suggestions are directly linked, through SeniorsGuideOnline.com, to resources in a senior’s area. Despite its comprehensive nature, the form only takes a few minutes to complete. No personal information is required, so the user won’t be inundated with follow-up communications as a result of completing the form. 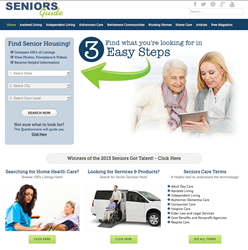 Find this assessment tool at: http://www.seniorsguideonline.com/evaluation.